This board is more than an amazing light wind performance board. 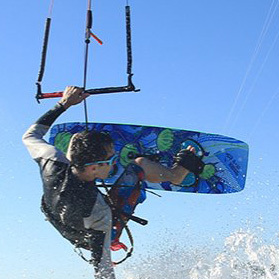 It is a board that will enable beginners and entry level kiters to progress with great success. The Wing has evolved into the ultimate light wind machine! Riding in ultra light wind has never easier, even for the big guys. The tip-to-tip radical concave smooths out chop and makes for a very positive carving feeling. Tips are very thin and flexy with built-in torsion bars to maximize carving performance under load. This board is truly a "session saver".